If you seek simplicity in architectural design, Greek Doric columns are the way to go. 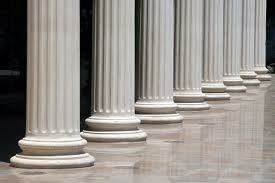 Of the three types of columns used in Greek architecture, Doric columns are by far the simplest. They consist of a capital, which is the top or crown, which is made of a circle topped by a square. The shaft is the tall part of the column; it’s plain and has 20 fluted sides. Doric columns have no base; they sit right on the ground. Greek Doric columns are plain but make a powerful impression; they worked very well on the Parthenon in Athens, one of the most well-known and studied buildings on Earth. Stromberg has fashioned Greek Doric columns in GFRC (glass fiber reinforced concrete), for palaces, mansions, and government buildings all over the world. Doric columns can be the distinguishing characteristic that makes your home or business stand out. The artisans at Stromberg will craft your GFRC Doric columns in true architectural proportions using molds. GFRC Greek Doric columns from Stromberg will be made for you with a focus on detail, quality and affordability. You’ll appreciate their wide choice of textures, colors and finishes, and the fact that GFRC is such a multipurpose material. It’s lightweight yet long-lasting and can stand up to anything Mother Nature can dish out. Stromberg stands by the beauty, quality, style and ruggedness of this versatile material. GFRC is reinforced with glass fibers instead of steel and so is rust resistant. GFRC is a sustainable architectural material. Glass fiber reinforced concrete from Stromberg comes in a variety of textures like natural stone, limestone and acid wash.
GFRC is lightweight but very durable. GFRC is a fire-retardant material. Greek Doric columns in GFRC can transform your home or building into a work of art. Columns are one of Stromberg’s mainstay products; you’ll be proud of the classical architectural touch these columns will bring to your establishment. The specialists at Stromberg Architectural Products will put their 30 years of experience and extensive knowledge to work on your GFRC Greek Doric columns. They’ll work with you to make sure your objectives are met every step of the way. Stromberg is here to help with CAD details, design assistance and specifications. Contact them today at (903) 454-0904 for your free custom quote, and put their 30 years of experience to work for you.